Sopheap Pich's installation "Compound," at Seattle's Henry Art Gallery through April 1, blends the architecturally fanciful with some chilling undercurrents from Cambodia's troubled history. “Compound,” by Cambodian artist Sopheap Pich (pronounced “Sew-Peep Pick”), soars in the atrium space at the Henry Art Gallery like some bamboo-and-rattan homage to Angkor Wat. It has pointed peaks and rectangular ramparts that dominate their setting, yet are latticework-light. The piece seems fancifully “architectural” at first. But on closer scrutiny, it’s more chilling. Its rectangles feel like claustrophobic cages. Its tapering domes, when viewed from a sidelong angle, resemble undetonated bombs. As for its folksy construction materials, they tap directly into a Cambodian landscape where bombs and bodies from the Khmer Rouge era can still be found, with a little digging. As the 40-year-old Pich explained while lecturing in Seattle last week, he was born into “a very tumultuous time” and that tumult is subtly echoed in his work. The 1970s were the years of the Khmer Rouge, the Communist movement that forced an agrarian agenda on the whole country, emptying out cities and killing anyone who didn’t go along with the program (estimated death toll: close to 2 million). In 1979, Pich’s family escaped to a refugee camp in Thailand. In 1984, with the help of a church sponsorship, they moved to the U.S. In college, Pich did pre-med studies, then switched his major to art. He got his bachelor and master degrees, as a painter, at the School of the Art Institute of Chicago, but upon completing his studies, he didn’t know how to proceed. In late 2002, he moved back to Cambodia because, as he puts it, “I was so lost.” His family remained in the U.S. Dissatisfied with painting, he looked for a more physical way of working. Sculpture seemed a possibility, but he couldn’t afford carving tools or stone. He turned to bamboo and rattan because they were cheap. The very first piece he made with them in 2004 — a rough depiction of a pair of lungs — caught the eye of an attaché at Phnom Penh’s French Cultural Center who offered him a show. Exhibit offers and commissions followed swiftly, and Pich’s pieces grew ever more spectacular in shape and scale. 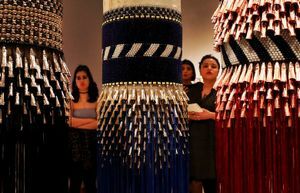 Although Pich’s pieces appear to be woven, they aren’t. After being sliced and boiled, his rattan and bamboo strips are simply tied with wire into shapes that he improvises on the spot. “Compound” was featured in the Singapore Biennale but has been reconfigured to take advantage of its setting at the Henry. It’s accompanied by crisp photographs Pich took of his rapidly changing Phnom Penh neighborhood, where swamps and lakes are being filled in to make way for high-rises. Again, Pich says, he’s merely observing, not commenting. In sharp contrast to Pich’s installation is “Carolee Schneeman: Within and Beyond the Premises,” a retrospective of the New York artist’s work. Schneeman’s paintings, photos, sculptures and films are messy, raucous, humorous (sometimes) and graphically sexual. They’re also exploitative. When Schneemann’s exploiting herself and her lovers, that’s fine. But her use of 9/11 images as art fodder (victims falling from the World Trade Center in “Terminal Velocity”) may strike some viewers as despicable. You can immerse yourself in all things Schneemann-ian this weekend with a “performative/lecture” by her on Friday and an all-day symposium about her work on Saturday with local performers Tonya Lockyer, Waxie Moon, Marissa Rae Niederhauser.